Mondo Grass and Black Mondo Grass are actually not even grasses. 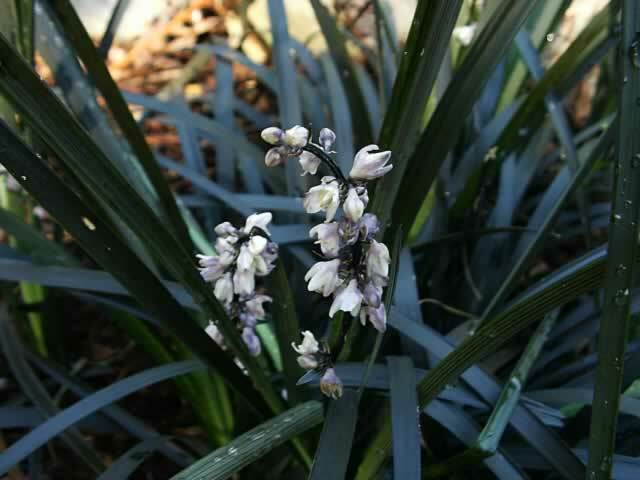 At one point in time, they were classified as being in the Liriope family until the plant name gods realized they are actually lilies that are closely related to the Lily of the Valley (Convallaria majalis) and gave them the designation of Ophiopogon. Their berries each bear a single seed. They are very easy to care for, durable, and trouble free plants that are excellent as long lived ground cover plants. Black Mondo Grass, Ophiopogon planiscapus 'Nigrescens' is hardy in zones 6-10. It grows as neat, slowly spreading, 4" tufts of ¼" wide, sweetly fragrant, straplike leaves. New foliage emerges dark green in spring then changes to dark purplish-black by summer. 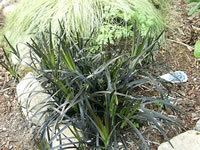 Black Mondo grows to about 10" tall, and will slowly spread to about two feet. 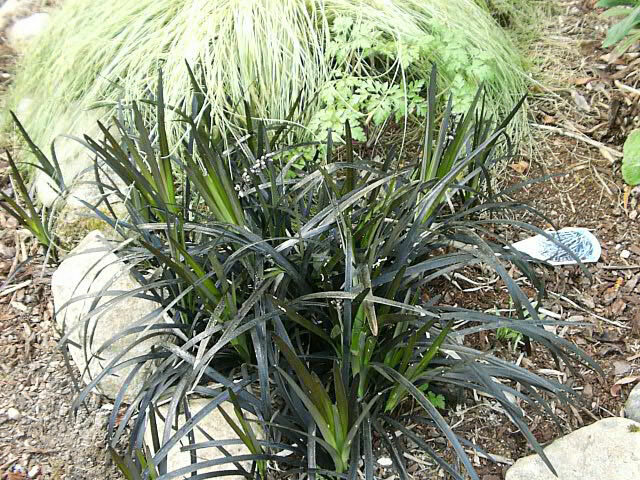 The distinctive black foliage makes this an excellent plant for rock gardens and border edging, and for highlighting lighter colored plants. It looks great, growing in a planter. Mondo Grass, Ophiopogon japonicus is sometimes mistakenly identified as Lily Turf, which has wider leaves and larger flowers. Mondo grass slowly forms tight, 24" matted clumps of 8"-12" long, 1/8" wide, bright green, grass-like foliage. Spikes of small, lavender or light purple flowers appear in the late summer, followed by small blue berries. Mondo grass is an easy care plant suitable for growing in a container, works well in rock garden, and looks great in mass plantings. Cut back old foliage in the spring to tidy up the plant and promote new growth. They should be planted in well draining, slightly acidic soil (pH 5.5-6.5). 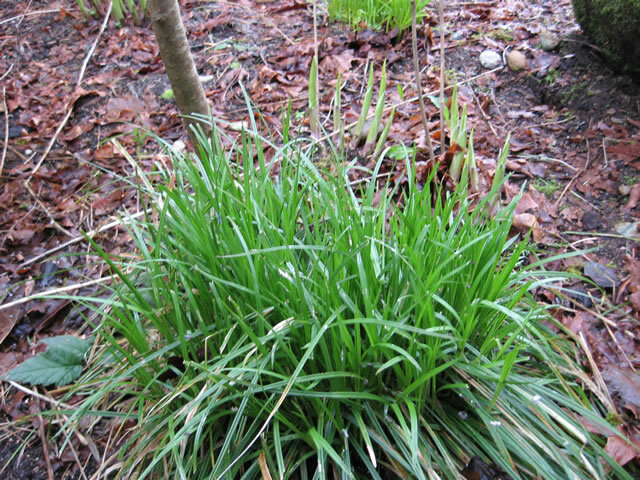 Ophiopogon Plants are not particularly hungry, so a light application of a balanced fertilizer or a top dressing of compost in the spring is usually all the feeding that is necessary. Take precautions to protect these plants from slugs and snails! 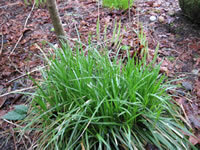 Mondo Grasses can be propagated by division, which should only be done in the early spring, before new growth begins. Soak Ophiopogon seeds in warm water for 24 hours, before sowing. Seeds can be sown directly in the garden during the fall. Seeds that are started indoors, in early spring and kept at 65°-70° F. will germinate in about 30 days.